Similar to last year’s event, the line-up for registration started early on April 29 at NAIT’s Hokasan Centre for Culinary Arts. Honestly, we don’t blame our attendees, considering brunch was soon to follow after registration. The staff at Ernest’s always provide a great assortment of cold and hot brunch items, which helps fuel everyone through their kitchen sessions. But before the cooking commenced, everyone was treated to a duo of keynote presentations. Filmmaker Kevin Kossowan, freshly back in Edmonton from New York City where he was nominated for a James Beard award, went first and shared how this year's event theme is truly his life story. From the moment he started growing peas, he realized that he wanted to buy food as little as possible. As Albertans, we have opportunity to do a lot with the food that comes from our own backyard and there are many opportunities to grow your own food, even in an urban setting. In the end, Kevin’s presentation left us with some points to think about. Meanwhile, the presentation from Redtail Farms' Ian Griebel focused on how we have changed the way we view the natural world, especially with a growing urban centre. While we have become disconnected from nature in some ways, Ian believes we can make a positive difference if we start treating the land differently. This includes treating problems at the root cause, not the symptoms. He also brought the theme of More with Less into his presentation, saying how the land can thrive if there are more farmers on less land. It won't be easy, but with some determination and hard work, these changes can be possible. With brunch-filled bodies and knowledge-filled minds, it was finally time to start cooking, so our attendees followed our volunteers into one of four kitchens for their kitchen sessions. Each participant got to experience two sessions, along with a snack break in between that featured mini Ohana donuts and vegan muffins/scones (courtesy of our own Kyra Cusveller). Steven Brochu and Zach Eaton during one of the breadmaking sessions. For our kitchen sessions, we were thrilled to have two returning presenters. The first was Chartier’s Steven Brochu, who brought the restaurant's Chef de Boulangerie et Recherche, Zach Eaton, with him to teach our attendees how to make sourdough bread. The class was a natural fit for the Chartier duo and it was constant smiles around the room from the demonstrations to taking the bread out of the oven. However, that baked loaf was not the only thing attendees took home, as they also made their own mother for future use. Elyse Chatterton shows some examples of offal to her session attendees. In the kitchen next door was our other returning presenter, Elyse Chatterton, who provided a new set of attendees with skills and understanding when it comes to offal. While offal refers to anything that is typically thrown out after an animal is slaughtered, in this class, Elyse showed the value of some of these cuts. This included some samples of crackling with homemade sriracha mayo, lamb liver tacos and marinated beef heart carpaccio. For their part, attendees carved up a beef heart to take home. Now, it’s not every day that you see a butcher and a vegan in neighbouring kitchens, but that's exactly what happened at Eat Alberta 2018. Sarah Louise Foster works with our attendees to make vegan BBQ sandwiches and cookies. Because this year, Sarah Louise Foster from Blue Rose Baking Co. was able to show her session participants how to vegan-ize almost anything, including barbecue and baking. Sarah’s passion is baking, so it was no surprise that even the leftover salted chocolate vegan cookie dough was thoroughly enjoyed once the cookies were in the oven. That said, the smell as they were preparing their barbecue sandwiches would remind anyone of a summer day on the patio so much that they would forget that they’re cooking jackfruit, not pulled pork. Blair Lebsack provides instructions for how to make savoury porridge. 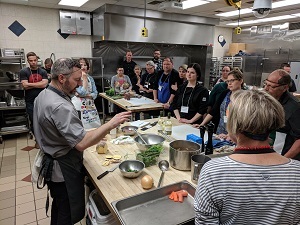 Last, but certainly not least, Rge Rd’s Blair Lebsack taught our attendees how to make a savoury porridge. As Rge Rd is known for using lesser-known ingredients, it was no surprise that this dish truly embraces the ideas behind More with Less. From farro to blood sausage to duck gizzards to rutabagas, this porridge had it all. And thanks to great ingredients and collaboration throughout the kitchen, participants were able to take a nice portion size home to enjoy. Once the cooking was done and the take-home containers were packed up, attendees enjoyed our closing reception with food from Ernest’s. They could also enjoy a drink, which included beers from a variety of Alberta craft breweries. As previously mentioned, our silent auction brought out a bit of a competitive streak in our attendees, but again, who can blame them with items from Salgado Fenwick, Jacek Chocolate Couture, Sherbrooke Liquor, Evoolution and more? As we close the door on Eat Alberta 2018, thank you to all of our attendees, keynote speakers, kitchen presenters, sponsors, silent auction donors and everyone at NAIT for your help in creating a fun, food-filled day! 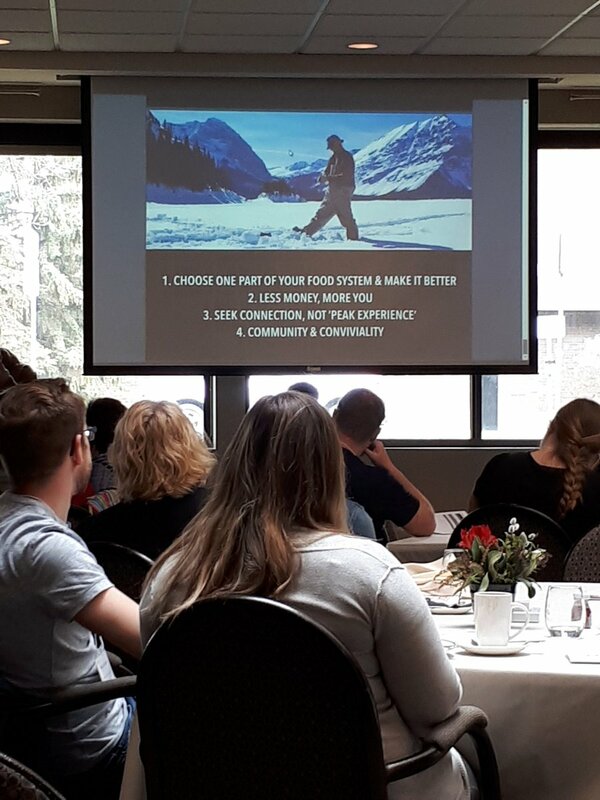 We are so grateful that we can keep hosting these events and look forward to providing you with more information about Eat Alberta 2019 and other future events.